You won’t believe how easy this Creamy Chicken Tortellini Soup is! Hearty, comforting and made in the slow cooker. It really doesn’t get easier than that! Before we start talking about how delicious this soup is, I must confess something important. *insert suspense music here* The thing is… I am generally not a soup person! Shocking, I know. But I’ll explain: I grew up in a family that used to go on several “soup diets” and I, unfortunately, had my fair share of boring, weight loss soups that tasted like I would rather eat grass. It wasn’t until I became a serious foodie (as in owning a food blog) that I started enjoying soup again. Mostly due to the influence of my husband, who is a huge soup guy and always orders the “Soup of the Day” when we go out to eat. So having that background in mind, it is safe to say that the stakes are HIGH when soups are concerned! If it’s not crazy delicious, meh, I will have a spoonful and push it aside. If it is phenomenal, I will go for seconds and thirds and that recipe will become a regular on the menu. Just like this Creamy Chicken Tortellini Soup! I know what you’re thinking. It is easy to make something delicious when @BarillaUS is involved. And I agree 100% as it’s no secret I’m a Barilla Girl! I am especially in love with their artisanal, all natural tortellini and am really happy that I can easily find it at my local #BJsWholesale (for a limited time only, unfortunately!). Because let’s not forget something really important about me: as much as I love delicious food, I adore convenience. Good quality ingredients that are easy to find + a slow cooker + a good and easy to follow recipe? I am in heaven! 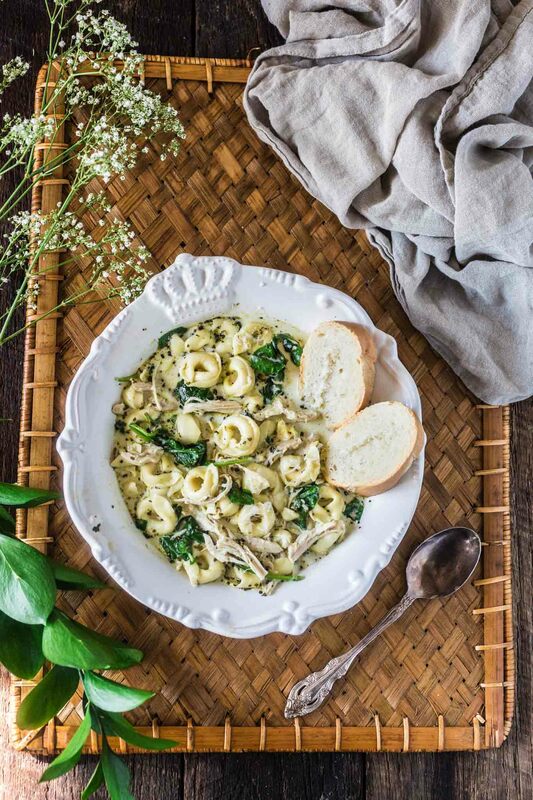 For this twist on a classic Chicken Tortellini Soup, I couldn’t resist adding cream and #BarillaPesto. 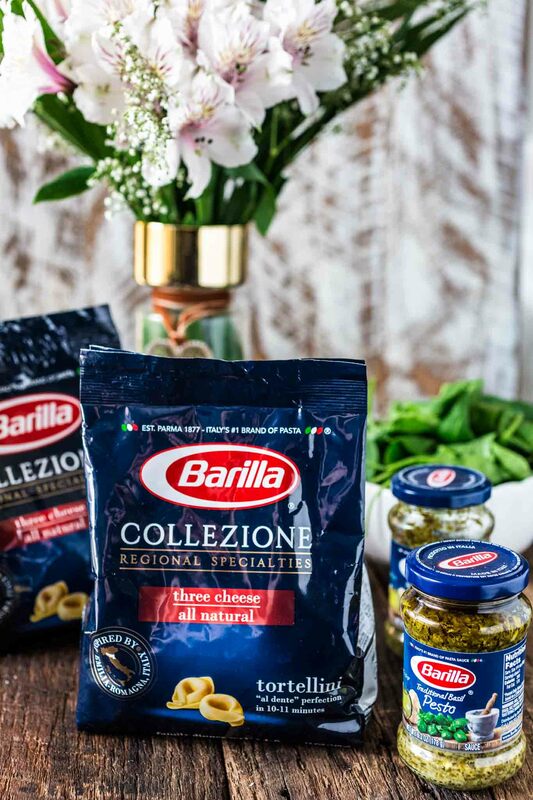 Made with only the highest quality ingredients – like sweet basil, aromatic herbs and extra virgin olive oil – Barilla Traditional Pesto Sauce takes this soup to a whole new level of fresh deliciousness. 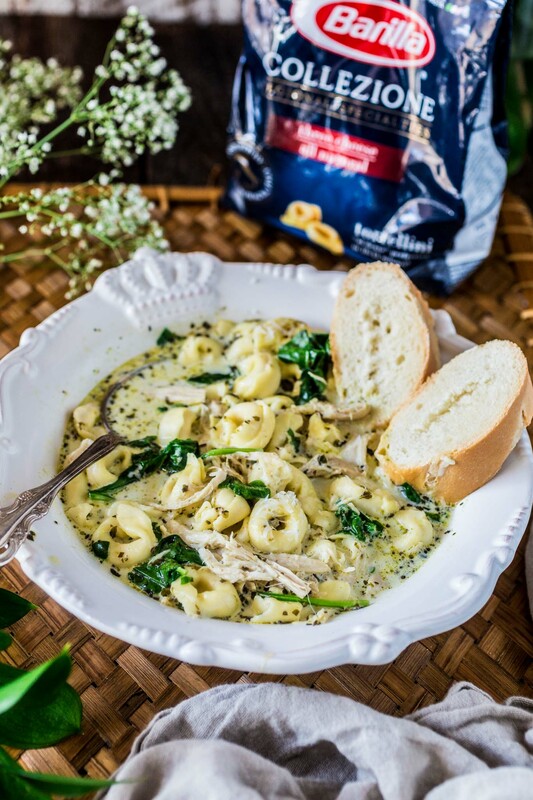 The pesto complements #BarillaTortellini perfectly, making this soup an indulgent-tasting dish, perfect for the cold months ahead. I don’t know about you, but for me, the ideal Fall evening involves a bowl of soup (or stew), blankets and my favorite Netflix show. I guess it is true that life’s all about the simple things! If you’re watching calories, you could omit the cream, although I would advise you to save calories elsewhere as there’s nothing like a creamy soup. But if you absolutely must, the soup will still taste delicious, it just won’t be creamy. Also, make sure not to overcook the tortellini, as it will fall apart and you will end up with a mess. Edible, yes, but not phenomenal. After all, tortellini tastes best when it’s al dente! I hope you guys enjoy this recipe as much as we did. Tim, my soup lover husband, went crazy over it and devoured the whole thing in one sitting. Good thing I was able to eat a bowl before it was all gone! Combine the chicken, chicken broth, pesto sauce, garlic powder, Italian seasoning, salt and pepper in a slow cooker. Cover and cook on low heat for 7-8 hours or high heat for 3-4 hours. Remove cooked chicken and shred, using two forks. 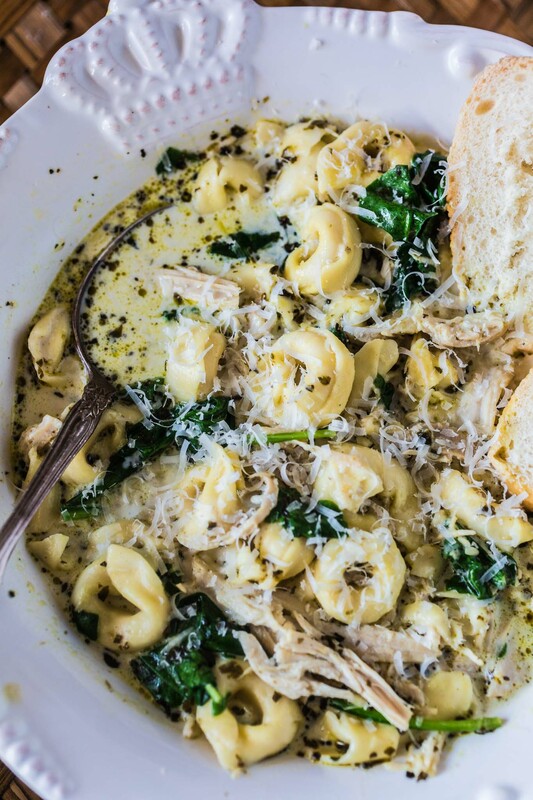 Return the shredded chicken to the slow cooker and add the tortellini. Cover and cook on high heat for 15 minutes or until the tortellini is al dente. Add the heavy cream, baby spinach and parmesan cheese. Cover once more until the spinach wilts. Serve immediately with some more parmesan cheese and crusty bread.